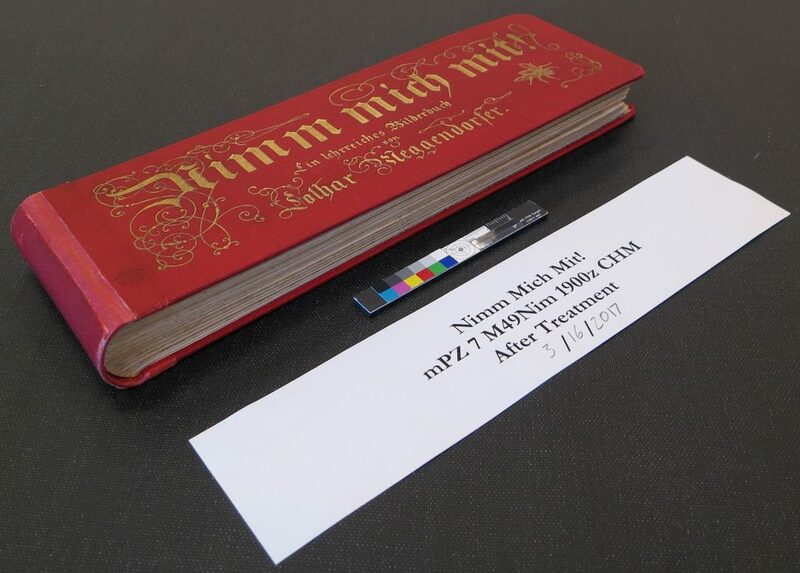 This blog post was written by Noah Smutz, book conservator. Nimm Mich Mit! by Lothar Meggendorfer is a lovely early 20th century German visual dictionary filled with colorful illustrations. They include everyday objects including geometric shapes, kitchen utensils, clothing, plants, animals, people at work, and house interiors (learn more in a recent blog post ). This book is part of the Cooper-Hewitt Museum National Design Library collection in New York City. Left: Upper board, before treatment. Right: Upper board, after treatment. Left: Title page, before treatment. Right: Title page, after treatment. The book was adopted for preservation as part of the Smithsonian Library’s Adopt-a-Book program. It arrived on my bench with split endsheets, the textblock separated from the case, and loose pages. The book was printed on wood pulp paper that has become acidic and brittle. The textblock was originally held together with a cloth spine lining attached to each gathering with three staples that have rusted. The combination of staples and brittle paper caused most of the spine folds to split. Once the staples were removed, a stack of loose pages remained. Left: Spine, before treatment. Right: Spine, after treatment. In order to rebind the book, the loose pages were guarded. Guarding is a technique where a spine fold is recreated or reinforced, usually by using wheat starch paste and Japanese paper. Brittle paper requires extra care when guarding because the pages can break at the edge of the repair causing further damage. In addition, acidic paper often requires that both the inside and outside of the folds are guarded since one side of the page can lift away from the repair as the paper is flexed when pages are turned. One consequence of guarding is that introducing any repair—even with thin tissues to the spine folds – will add swell or thickness to the spine creating a trapezoidal, rather than square textblock. It was at this point in the treatment that the repaired textblock was brought to our Imaging Center so the pages could be digitally scanned without creating additional stress to the book structure. David Holbert, Digital Imaging Specialist, wrote a blog post providing context for the purpose of a book like this. To see more images of this book please see the Internet Archive. 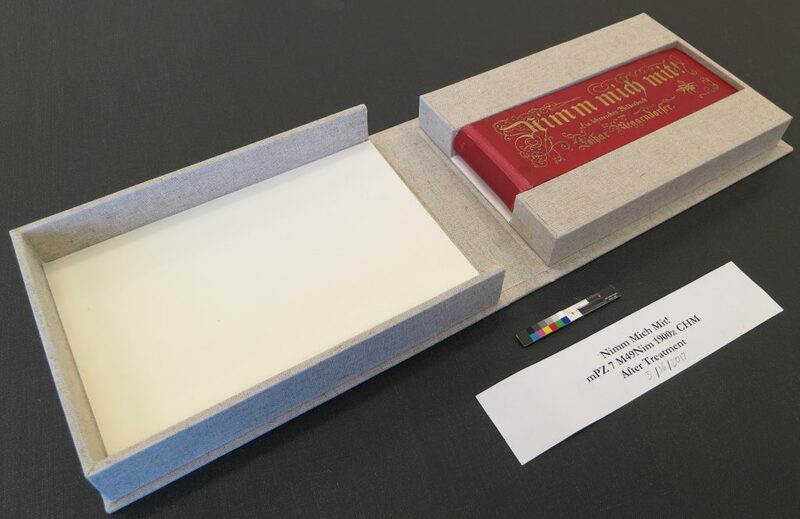 Following digitization, the textblock was sewn on linen tapes, the spine was rounded and backed to address the additional swell, and the spine was lined with Japanese paper to prepare the textblock to fit back into the original case. To facilitate the larger spine, the joints of the cloth case were slit completely separating the boards from one another. A new spine was created using a laminate of aerolinen and toned Japanese paper. Then the textblock was adhered to the case and the original spine covering was attached to the outside. A custom clamshell box was constructed to further preserve the book while it is in storage. A modified box was constructed, making it twice the height of the book. This adds protection since the book would otherwise sit much lower than the other shelved items around it and is likely to be damaged or lost as a result. Book in box, after treatment. This was a successful treatment to help preserve this book for future research. The Adopt-a-Book program at Smithsonian Libraries allows us to treat at-risk items in the collection and to use digitization as a preservation tool—providing more access to items through scanned images while requiring less frequent handling of the object.